Yesterday was a comedy of errors. Tom and I were going to an Indian wedding, and thought that celebratory masala dosas would be a good way to start the day. After much research, I decided to use Hugh Fearnley-Whittingstall’s recipe. 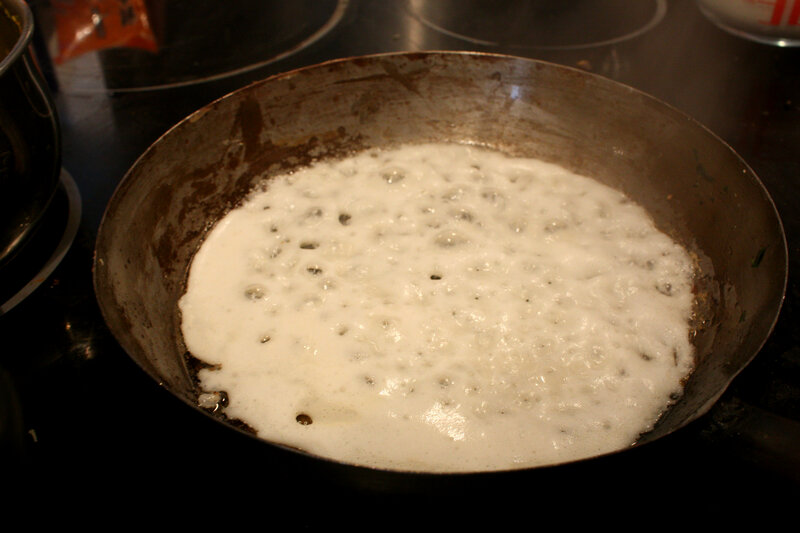 So we began preparing the dosa batter on Thursday – soaking the rice, and soaking the urid dal. On Friday, we added a little water (the recipe doesn’t specify how much), and we blitzed the dal into a smooth, fluffy paste, and blitzed the rice into a “slightly gritty” paste, as the recipe described. We combined the two, covered the bowl with clingfilm, and left it next to the boiler overnight to bubble and ferment. I woke up yesterday morning. I made a coffee, and started cooking the traditional spiced potato filling for the dosa pancakes. I loosened the dosa batter with a bit of water (maybe this wasn’t a good idea?) and I tried to cook a dosa. Firstly, the batter was far too thick, and didn’t spread evenly across the bottom of the pan. It was more like a very thick, gritty drop scone mixture. I stirred in a bit more water, but then the batter seemed to separate so you could see the individually ground grains of rice. It bubbled and wouldn’t bind. And after several failed attempts, had to be binned. “When life gives you lemons, make lemonade” – so the saying goes. And despite having no dosas, we still had the dosa filling. 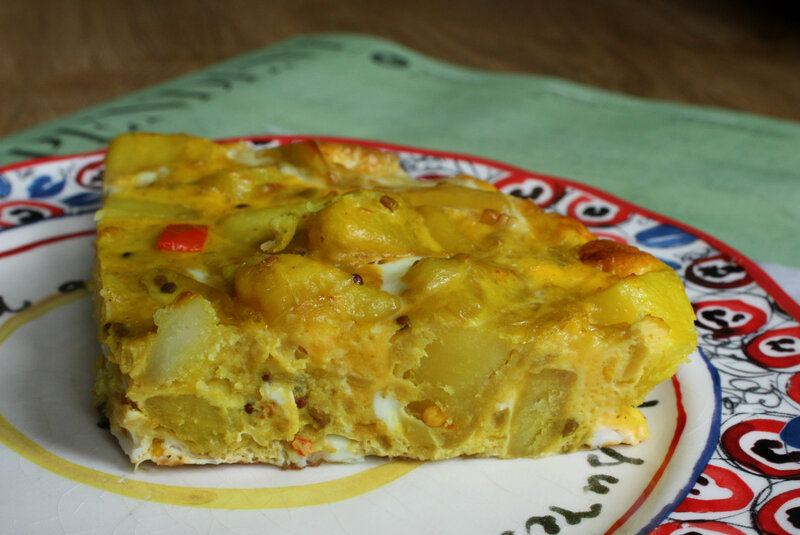 So I added four eggs, and made a blindingly tasty Indian-style, Spanish Omelette. I washed up, showered, put on my sari, and set off to the wedding — my tongue tingling with Indian spices. Just as Tom and I were leaving though, we looked at the invitation….for Sunday. As I said, a comedy of errors. Anyway, today is a new day. We had bacon and eggs this morning. And now I’m off to tie my sari again, and head off, having read the invitation a bit more carefully this time. Add the cubed potatoes to a pan of tap water. Bring to the boil. Simmer for five minutes and then drain —so they’re parboiled, and still holding their shape. Meanwhile, fry the onion in the oil until it’s turning translucent. 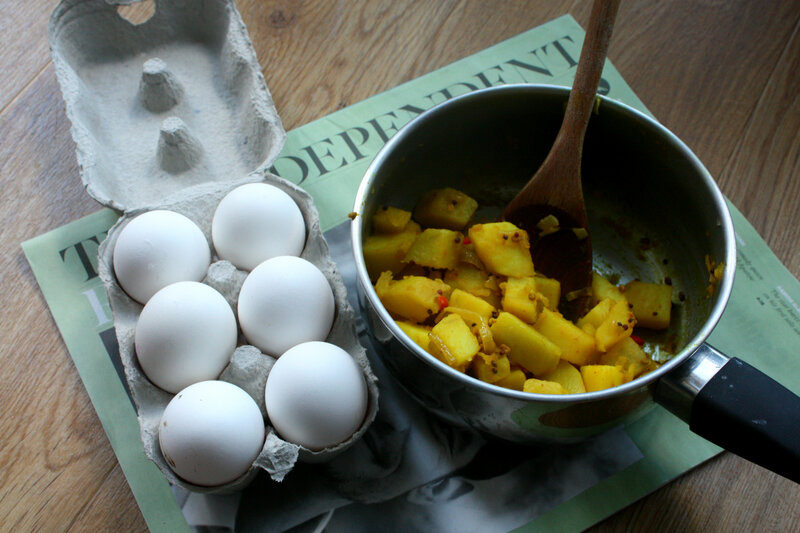 Add a little extra oil to the pan if needed, and then add the mustard seeds, chillies, fenugreek and tumeric. Tip the potatoes into the pan, and stir so that they’re coated in the spices. Pour a bit of water into the pan — just 1-2cm deep, and then put on the lid, so that everything steams and simmers gently for 15 minutes until there’s no water left. 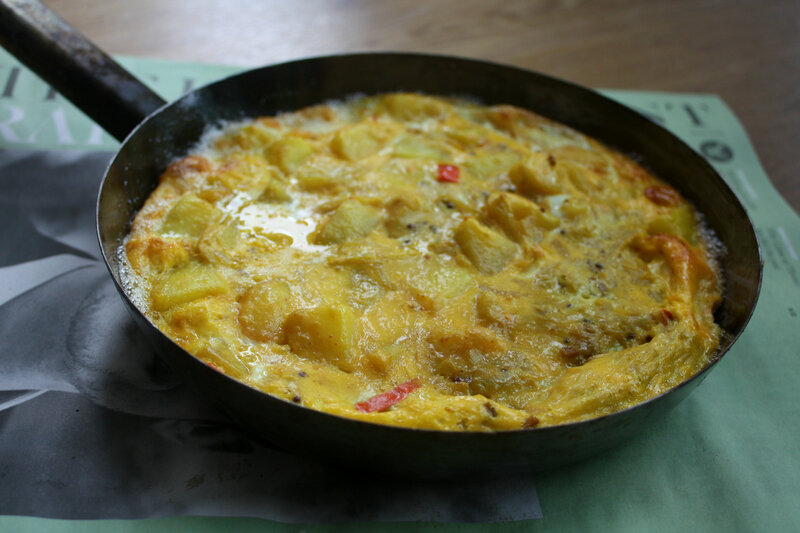 Stir in the four eggs, and tip into a frying pan which can go into the oven. Cook for 5 minutes on the hob, and then transfer into the oven for another 5-10 minutes, until it’s cooked. Turn out, slice up and enjoy with sauces or chutney of your choice. A happy mistake. I’d love to go to an Indian wedding.